Fearless Meat is a new restaurant that popped up in January on Kingston Road, between Pickering and Beech Avenues. 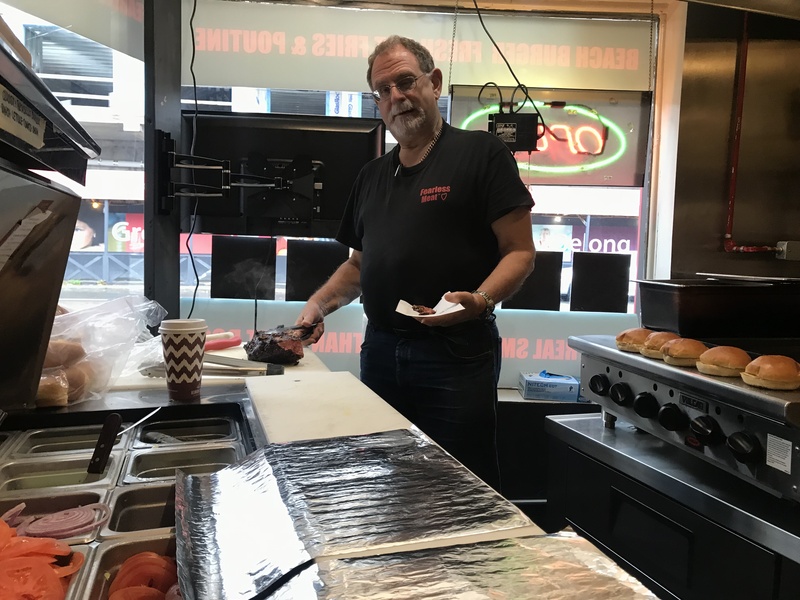 Owner David Brown is an internationally recognized, experienced butcher, meat consultant and barbecue expert bringing high-quality food to the Beach at reasonable prices. Brown is from Kincardine on Lake Huron, also known as the “west coast of Ontario”, and moved to the Beach in 1982. The University of Toronto and McMaster MBA graduate was taught the skills of butchery at just 17 years old. Over the years, he has raised thousands of dollars for organizations such as the MS Society of Canada and Foodshare. He opened his first store the ‘Meating Place’ in 1982, and has been a member of the International Association of Culinary Professionals (IACP) since 1988. Along with being a Redpath Senior Executive and in management for Dominion, Brown has trained government meat inspectors and served on the Canadian General Standards Board in Ottawa. The restaurant owner was also personally honoured by culinary icon Julia Child calling him “The Butcher of Canada” after he cooked for her and 200 of her friends in Rhode Island. After a range of accomplishments, Brown put together the Fearless Meat’s menu which includes six-ounce Angus Beef Burgers, Lester’s Montreal Smoked Meat, Nathan’s hot dogs, Ace Bakery buns, homemade chilli, soup and slaw. The restaurant is closed on Sundays for the winter season, and right now Beach seniors can now enjoy a soup and hot beverage for only $2.99 any other day of the week. Free coffee and ice cream are also offered to emergency first responders, veterans and their spouses all year round. From Nov. 5 to 10, Brown also offered free burgers to all war veterans and their spouses. There are some upcoming Saturday specials including a free knife-sharpening clinic on Nov. 17—no pre-registration or ticket purchase is required. Turkey carving sessions will be available before Christmas as a kickoff to the ‘Fearless Meat Academy’, a program Brown wants to implement to elevate meat knowledge, while giving back to the community. If you’re looking for top notch food products for affordable prices, check out Fearless Meat located at 884 Kingston Rd.